Christianwealth.com is an independent publishing service provided by Kingdom Media Limited. Our content is written by subject experts, including practitioners from the financial planning industry, investment management, fundraising, Church & Ministry disciplines. Our goal is simple: Help God’s people to make money and to live generously with it. As Christians we are called to be stewards of the resources that God has entrusted to us. Our desire is for christianwealth.com to be a community of people sharing their experiences, wisdom and their understanding of what God’s word says about money, wealth and business. The world is plagued with financial websites and publications providing tips, predictions and strategies, often contradicting each other, and much of it very distant from the biblical model of personal finances and business. We’re here to help change that. We want to see a culture within the Christian community of people handling money according to biblical principles and then being able to share that with the wider world that is confused about money. We want high quality writing, well-researched opinions and thoughtful arguments. We encourage our readers and writers to comment on current articles as well as contributing fresh material. To write for us, you should be considered an expert in your field, not simply someone who wants to access our readership. Articles should be relevant, engaging and written in every day language that a typical non-financial person could understand. The articles must not be a form of product or website promotion. Your articles should be based on biblical principles and be written on the belief that the Bible is the word of God. Articles should be around 800 words, up to a maximum of about 1,200. Please write in Microsoft Word or Google Docs. Generally, contributions should target an English-speaking reader and represent a good use of the English language. The majority of our readers are in countries that would be described as the western world. Christianwealth.com does not necessarily endorse or agree with every viewpoint that we publish. However we endeavor to only publish material that we believe is factually correct and in line with God’s word. We appreciate that the body of Christ is diverse and opinions can differ. We will not publish material that we believe directly contradicts the Bible’s position. The writer and their organisation will be listed on every article. We encourage the use of statistics and relevant reference material, however your submission of an article to us is an acknowledgement that the article is original and not in breach of any copyright laws. We may ask you to clarify, check or substantiate articles you provide to us. Your articles should not ridicule, denigrate or harass anyone. Christianwealth.com is a community of people sharing ideas, and we offer an opportunity for competent writers to voice their thoughts and beliefs. Generally we do not pay for articles. To encourage a wide readership we do not charge readers a subscription fee for accessing content on christianwealth.com. From time-to-time we will request articles written for a set fee. If we do not pay you for your article then copyright remains with you but Kingdom Media Ltd (publisher of christianwealth.com) has an unlimited right to republish, or use for any other reasonable purpose, including selling the content on other sites controlled by us. In the event we pay you for your article, copyright immediately transfers to Kingdom Media Limited. 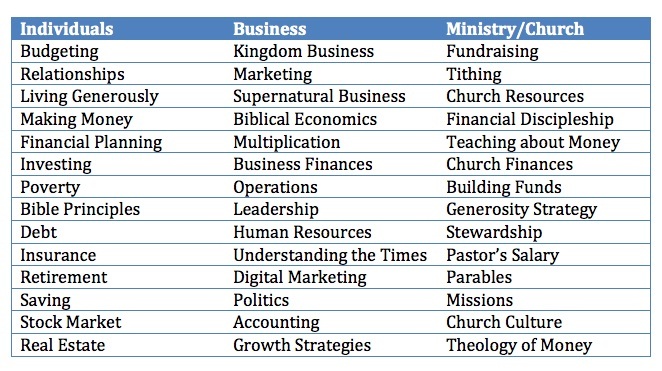 Articles may contain general financial product information, but Christianwealth.com (Kingdom Media Ltd) is a publishing service and does not hold a Financial Services License. We are not authorized to provide personal financial advice and have no intention of doing so. Christianwealth.com (Kingdom Media Ltd) accepts no liability for any actions taken by readers or writers as a result of material published on our website, in our newsletters or any associated publication we provide. Readers should be aware that strategies, concepts, ideas and theories mentioned in any articles may not be relevant or suitable for them, and may be subject to a various risks. Christianwealth.com is not attempting to influence the sale or purchase of any investment, and all readers should obtain personal independent financial advice. If you have a special skill or area of knowledge that could benefit our readers then we’d love hear from you.